In this context, the new 2017/18 data is important because it is our first sight of what local authorities are planning to spend in the light of these settled responsibilities and on the same definition as the year before and in response to the announced timeline of the trajectory of further cuts to their grant to 2020/21. This data therefore reveals how local authorities are prioritising where to spend the budgets they have and which services are likely to be losing out, and by how much. Figure 1 sets out what this looks like at the aggregate level in the context of the shifting grant over time. The data is based on actual outturn expenditure for 2013/14 through 2015/16, planned budgets for 2016/17 and the latest data for 2017/18. The dark blue bars show the headline numbers, the green like-for-like showing the effect of taking out the transfer of children’s 0-5 services from the latter years to give a less misleading comparison. 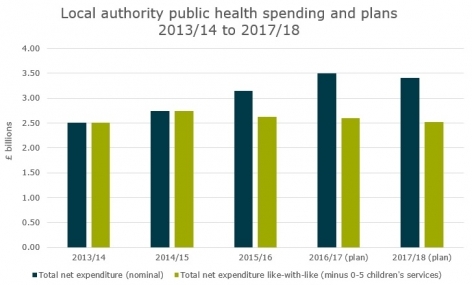 The latest data shows that 2017/18 is the first time that local authorities are planning a drop in public health expenditure in cash terms to £3.41 billion, a reduction of £85 million or 2.4 per cent since 2016/17. Once funding for children’s services is stripped out, the figure is £2.52 billion, almost exactly the same in cash terms as in 2013/14 (£2.51 billion). Once inflation is factored in, this year’s budget is worth around 5 per cent less in real terms than it was then. Over this time the population in England has also grown by around 3 per cent, placing further pressures on public health budgets. Figure 2 shows how local authorities plan to spend the £3.41 billion. The biggest category is prescribed services for 0–5 year olds, followed by miscellaneous public health services, drug treatment for adults, sexual health testing and treatment. These categories together account for more than half of planned spending. Figure 3 shows changes in planned spending for 2017/18 compared to 2016/17. Some of these are very big in percentage terms (though the biggest changes are in those with relatively small budgets). There are some winners, notably physical activity for children (and adults) and non-prescribed services for 0–5 years olds. The biggest losers in percentage terms are sexual health promotion and prevention and wider tobacco control, both facing cuts of more than 30 per cent; stop smoking services and specialist drug and alcohol service for children and young people also face planned cuts of between 10 and 20 per cent. Most other services also face cuts. 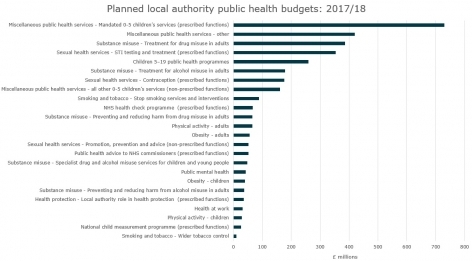 Some of these changes in priorities may be the result of shifts in how spending is categorised (although local authorities receive guidance on this). For example, Birmingham City Council reported planned spending on sexual health promotion and prevention of £14 million in in 2016/17 and £0 in in 2017/18, whereas it reported a rise in spending on sexual health testing from £1.6 million to £16 million over the same period, suggesting a change in how spending was categorised. This rise is big enough to shift the national percentages in Figure 3. If we assume that Birmingham’s plans on prevention and promotion in 2017/18 were actually the same as in 2016/17 then the national drop would be around 14 per cent (instead of 33 per cent); and if we assume in parallel that its plans on testing were the same as 2016/17, then the 1.8 per cent national drop would actually have been 6 per cent. Getting these categories right is therefore critical to our understanding of what is happening to public health, and Public Health England is rightly following up on this. In sexual health, as in other services, some efficiencies may have been achieved through re-contracting services and changing delivery models. In London, for example, there has been a move to online as opposed to face-to-face testing for HIV and sexual health services, which may explain some of the drop in expenditure on testing. However, despite this and issues of re-categorisation, there is little doubt that the findings here are real. For us, this is most apparent in sexual health; our wider work on the future of HIV services and on how GUM clinics are responding to financial pressures has pointed to services being cut, including in the under-the-radar areas of social support, promotion and prevention, where the initial impact is least noticed but where cuts now to the ‘soft underbelly’ are storing up potential risks for the future. But it’s not just sexual health services that are facing challenges. 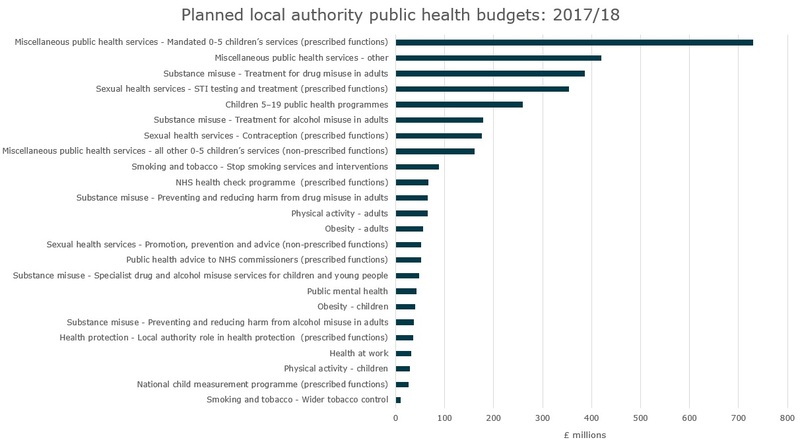 As Figure 3 shows, both stop smoking services and wider tobacco control are facing big cuts in percentage terms, with stop smoking services being one of the top four services in absolute planned cuts (£16 million). Others include prescribed services for children aged 0–5 (£17 million) and treatment for adult drug misuse (£22 million). Sexual health promotion comes top of the tree at just under £25 million, but as previously mentioned the Birmingham categorisation issue accounts for a large proportion of this. In conclusion, although some local authorities have been innovative in contracting and in seeking efficiencies in their public health budgets, there is little doubt that we are now entering the realms of real reductions in public health services. This is a direct result of the reduced priority that central government gives to public health. 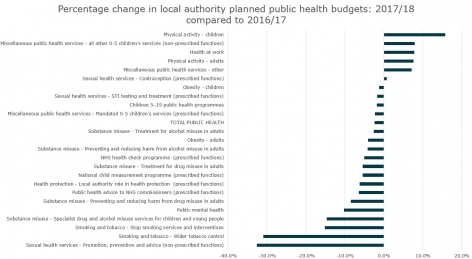 It should be no surprise that local authorities are having to react as they are given the pressures on their public health and wider budgets with an estimated £5.8 billion overall funding gap by 2019/20. We, among many others, have consistently pointed out the folly of this course of action. Increasingly, it seems the impacts will be seen in the public health services that local residents receive.